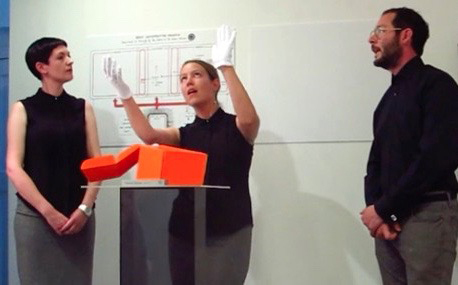 The Oracular Sponge (2014) Product packaging, press release and performance. The School of the Event Horizon were invited to contribute to an exhibition at Tenderpixel (London) entitled before breakfast we talked about the furthest visible point before it all disappeared. We devised a new product with predictive technologies that can be attached to the head, entitled The Oracular Sponge (Version 003.1a), and held a product launch with a lecture and demonstration. SOTEH also produced a limited edition print (Oracular Sponge Output: Time Granulation Cross Section) for Tenderbooks, and contributed research material to a Tenderbooks publication (Point of Divergence One: before breakfast conversations). Image (left): The Oracular Sponge Press Release (link to text). Images (right): The Oracular Sponge (product packaging). Performance at Tenderpixel (London). Images: Courtesy Tenderpixel/ Bori Soos.